"It's a totally new angle in tissue engineering." Bioengineers from the University of California, San Fransisco (UCSF) have figured out how to create bowls, coils, and ripples out of actual, living tissue. The researchers manipulated active cells from both mice and humans into folding themselves in ways that occur during natural development. Gartner and his colleagues use a unique method known as DNA-programmed assembly of cells (DPAC), which is a precision 3D cell-patterning technology. With this technology and active cells, they were able to create a tissue template which can fold and form itself in ways that occur organically during development. The team created simple models to predict the behavior, development and folding patterns of these cells and tissues. 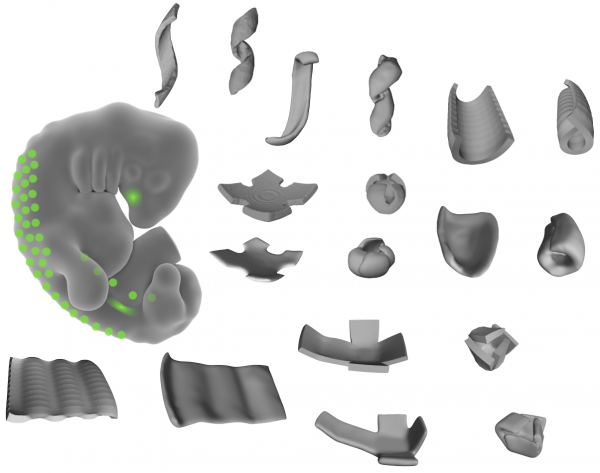 And, as a bit of a surprise to the team, the cells behaved as predicted, allowing the team to build living constructs from developmental folding and shape-forming behaviors. Going forward, the team hopes to explore the possibility of combining the developmental basis that dictates these folding patterns with other methods, natural or otherwise, of controlling tissue patterns and development. The group also aims to better understand how cells differentiate in response to mechanical changes that happen during tissue folding. It’s difficult to say exactly what applications the technique could have outside of research, but perhaps one day will we start seeing objects and shapes commercially developed using living cells. Could we one day use mechanical instruments, devices, and tools made with components of biological origin? The fields of cybernetic organisms and soft robots are advancing and developing rapidly. It would be premature to consider the realistic potential of this study for commercial applications, but even if it’s speculative for now, the ability to program biological materials into folding and developing 3-dimensional shapes and have control over manipulating active cells is certainly useful to researchers. Many have predicted that the next phase of “evolution” for humans is for us to merge with technology. Additionally, as we consider making humans more mechanical, machines are incorporating more biological elements.